Justin Diercks won the NASCAR AutoZone Elite Division, Midwest Series Spring Classic 150, Sunday afternoon at Rockford (Ill.) Speedway. 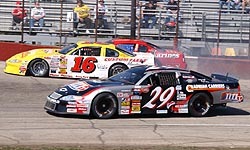 The event marked the first race of the 2005 Midwest Series campaign. Diercks inherited the lead on lap 30 when leader Dave Finney crashed on a restart and held off a determined Josh Vadnais for the win. Finney had just taken evasive action to miss the spinning A.J. Rhoads. When he did so, Finney made slight contact with the outside wall causing damage to his right front suspension. For Vadnais, the runner-up finish was his best career Midwest Series run. “We’re not in a position like that, where we’re leading, everyday,” said Finney. 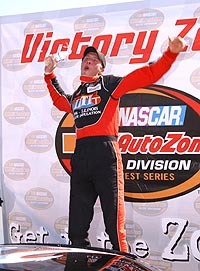 “We felt like we couldn’t give up the lead, and all that track position, to come in and look the car over,” said Finney. After a caution to clean the Finney mount from the track, Diercks pulled away to a two second lead. The focus then turned to Bauer’s impressive run as well as Hoffman’s charge to the front. 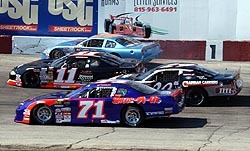 Bauer worked to the outside of Joanides and moved into the third spot on lap 43 while Hoffman had his hands full with Erik Darnell and Bryan Roach. Russ Blakeley brought out the final caution of the race on lap 81 for a minor spin on the back straight. He quickly righted his Chevrolet and the field was sent back under way on lap 85. Diercks once again opened up a comfortable advantage over Vadnais while Vadnais separated himself from Bauer. Diercks (#29) found himself around trouble all day long, but he was able to hold on for the win. With the laps winding down, Hoffman began his charge to the front, first muscling past Roach and then Joanides. With 53 laps remaining, Hoffman found himself in fourth spot, but nearly a full straightaway behind third running Bauer. Hoffman passed Bauer in the final laps and inched close to Vadnais as the checkered fell. Bauer came home fourth in just his third career Midwest Series start with Tim Schendel rounding out the top five. For Diercks, the win begins defense of his 2004 Midwest Series championship. “We’re going into this season the same way we did last year: Go out and win races and let the points take care of themselves,” said Diercks. Bud Pole fast qualifier Nathan Haseleu finished sixth while defending Spring Classic winner Steve Carlson placed seventh. Jeff Way, Brent Kirchner and 22nd starting Andrew Morrissey rounded out the top ten. The Midwest Series returns to action, June 4, at Colorado National Speedway, just outside of Denver.